We have a tough time getting our act together sometimes at Berean. On Tuesday we ran out of first class stamps for the studies and weren't able to finish them. Today we got all the studies stamped and ready to mail out but ran out of Bible stamps. We were 84 short. Ellen is on vacation, Aunt Bernie was called and she is going to go down to TEMCO to see if there are any Bible stamps there and if so I'll run down so our job can be finished for the week. Wish we could get our act together and have enough stamps of both kinds on hand to get the job done each week. 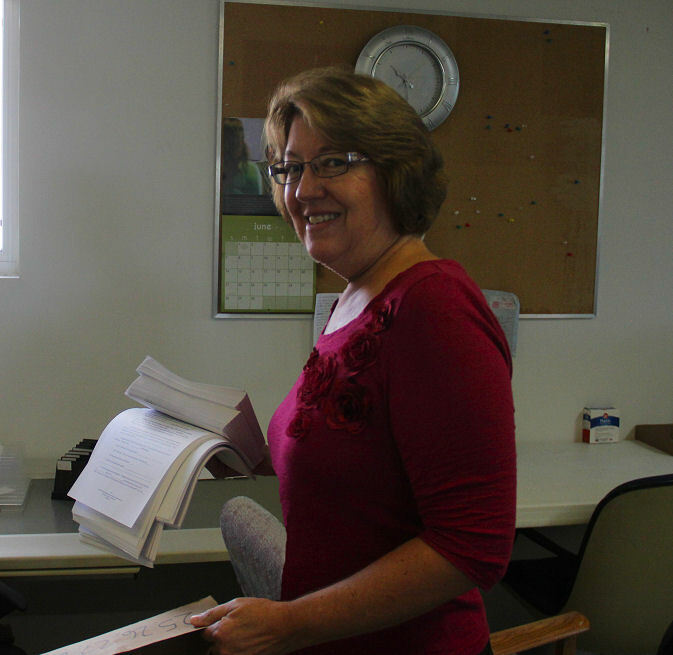 Below Diane is working on certificates for the prisoners that have finished all 50 of the lessons. Diane R was the only reader today but that worked out ok, there wasn't that many letters to be read. Below Edie and Roma are working on separating the studies from Tuesday while Shirley and Eva Jean take care of a few of the problem studies from Tuesday. 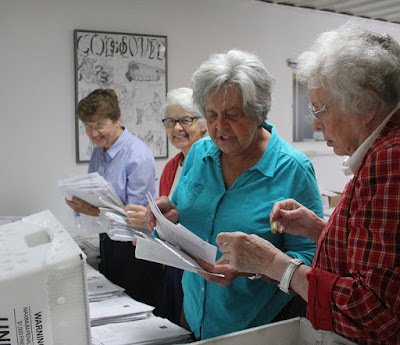 As Rachel was the youngest worker today she was excused from reading letters so she could label, stamp and carry out the Bibles to Diane's van for mailing. She will not need to go to the gym this week. Actually she probably won't want to, I'm sure her muscles are going to be sore from lifting those 32 pound boxes. 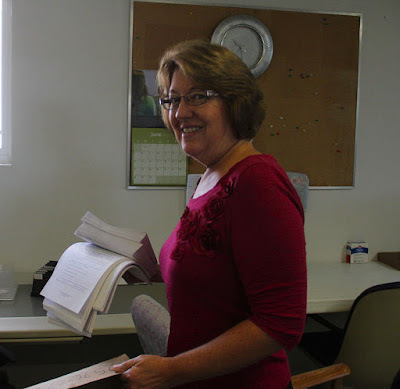 Diane H provided a tasty abundant lunch today for our small group of workers. We feasted! Tim Martin called to report Keystone was going to be sending him to Mexico for 3 weeks. He ordered us 2000 Bibles so we won't run short while he is gone. Hopefully they last until he returns.